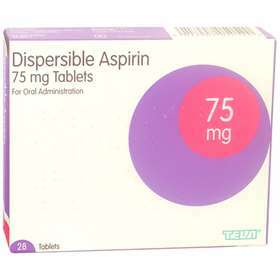 Dispersible Aspirin help to prevent heart attacks and strokes in people who have previously suffered from these conditions. It is also for those who have under-gone by-pass surgery. Dosage: The usual dose, for long term use, is 1 or 2 tablets once a day. Up to 4 tablets a day can be taken under the instruction of your doctor. Always seek medical advice first, before using this product. Please Note: Due to pharmacy regulations, we are only able to supply 3 packets of Dispersible Aspirin per order, per month. All generic products may change manufacturer from time-to-time so the packaging may not be as displayed above.